Over the last decade, a Hummer-mounted point air defense system that uses FIM-92 Stinger missiles and a 50 caliber machine gun, known as the Army's "Avenger" system, has become a common place fixture in and around Washington DC. This is true especially during times when the country is on high alert and they're hard to miss. Look a little closer and you'll see the Avenger system is actually hard-mounted to the tops of buildings in key strategic areas around the city. This includes at least one Avenger turret overlooking the White House at a nearby building. Still, these are infrared guided, short range, "last line of defense" systems that pack fairly light warheads. What is there to counter heavier threats and those that are identified further out from Capitol Hill? The Flight Restricted Zone, extending some 15 miles out from the center of Washington DC, along with Area51, are probably the two most famous airspace restrictions in the entire US, and maybe even the world. Multiple assets are used to monitor and enforce this sanitized bubble around the Capitol, from Quick Reaction Alert F-16s sitting "cocked and locked" at Andrews AFB, to Homeland Security helicopters with digital reader boards hanging out of their cabin doors (along with 50 caliber rifles for good measure). This dynamic air interception capability has been tested many times, and it seems to be incredibly effective in almost all regards. Still, air defense systems are usually built in layers, from the outer rung, usually consisting of airborne intercept capable assets, to the final last ditch defense, such as the mobile and fixed Stinger positions around the Mall and the Pentagon. To most people, these are the full extent of America's air defenses around Washington DC, but this leaves out a key middle layer in air defense capability that covers the vast majority of the restricted zone regardless of the vector of the target, its physical size or its force in numbers. 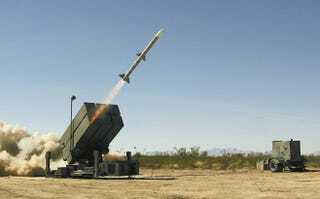 This layer is quietly provided for by the National Advanced Surface To Air Missile System, or NASAMS for short, a product produced by Kongsberg Defense & Aerospace of Norway. NASAMS is a very scaleable and capable intermediate range air defense system, developed directly from the AIM-120 AMRAAM series of radar guided air to air missiles. The missiles themselves are called SLAMRAAMS (Surface Launched Advanced Medium Range Air to Air Missile), or at least they were when the program was in active development in the US before it was cancelled. Although the SLAMRAAM is based directly on the hugely successful AIM-120 medium range air to air missile, it loses an incredible amount of range via its potential energy disadvantage in comparison with its fighter jet launched cousin. Range estimates are anywhere from 8-20 miles depending on what direction, speed and altitude the target is at in relation to the missile's launch location. Additionally, these figures are usually downgraded publicly to protect the missile's true range capabilities. Although the SLAMRAAM did not find a customer for widespread US military use, it did find customers in Europe. Following the attacks of September 11th, 2001, the once passed over weapon system became the perfect solution to persistently "patrol" the skies (from the ground) around the FRZ. The NASAMS "sixpack" SLAMRRAAM box-launchers, and their semi-permanent surrounding infrastructure. began to pop up around the Washington DC area 2005. These systems were in no way hidden from view, with multiple sites being located in suburban areas or directly off major roadways, and always close to major targets that the terror-lunatics would love to hit. NASAMS is actually built as its own modular integrated air defense system (IADS), with multiple sensors, including radar and electro-optical, placed in multiple locations around a region. These sensors feed a command and control suite via data link with a high-fidelity overall picture of the airspace around the NASAMS network. From here the launchers, also distributed around a region, can be activated against enemy targets. Additionally, being modular by design, NASAMS can also integrate itself seamlessly into a larger integrated air defense system, of which Washington DC has one of the best in the world. In other words, NASAMS does not just rely on its own radar system or electro-optical targeting capabilities, it can also use external "feeds" from other radar and electronic service measure type systems to target and engage hostile aircraft, including accessing a MIDS/Link16 data link environment. NASAMS' ability to integrate itself info a common "fused" multiple sensor "picture" of the airspace around it also allows for a more redundant and higher resolution capability to detect and engage targets under even the most challenging of circumstances. The Norwegian version of NASAMS has been widely deployed with great success, and the system is already in its second generational iteration, with a third, based on the Navy's very deadly and compact Evolved Sea Sparrow, right around the corner. NASAMS brings a radar guided weapon system to the menu of air defense options ringing our capitol, which could be highly beneficial when defending it against advanced enemy trespassers, or a possible (but hopefully unlikely) scenario where multiple aircraft of various flight profiles are involved in a single attack. These missiles have caused some concern in the neighborhoods where they are installed, yet even in a country where "not in my backyard" is increasingly becoming a national slogan, it seems that most of the people living and working around these suburban guardians understand that although having armed rockets in your area may be unsettling, their obvious utility seems to outweigh most people's superficial concerns. Still, it is hard for some people to really accept the fact that their own government may have to choose to shoot down an airliner full of their own countrymen in the interest of the greater good. Often times we read stories about Noble Eagle pilots, those who fly air sovereignty missions in defense of our air space after 9/11, and how they deal with the possibility of having to one day use their potent weapon system to do the unthinkable. Yet, it is a good thing for Americans to understand that this daunting task is not just in the hands of our "flying knights" of modern day, but it also sits in the hands of those who operate the NASAMS surface to air missile systems, and the integrated air defense system that supports its targeting. These silent warriors have a huge and necessary responsibility, from protecting Air Force 1 on the ground to our major intelligence installations, and they could get called upon in an instant to "neutralize" an incoming threat, at which point the grim task of firing would be clear. If an airplane, possibly filled with Americans, was on a hijacked route heading directly to CIA headquarters, or any other strategic installation, the choice to fire is obvious as either way the plane will most likely end up destroyed, while NASAMS could potentially save the lives of many living and working in and around the targeted facility. It is encouraging to see NASAMS on American soil, as it shows that the DoD is making sure that an attack like what happened to the Pentagon well over a decade ago never happens again. Such a system deters our would-be enemies from attempting to use an airliner full of innocent Americans as means of attacking our most sacred and important facilities, and it also shows residents around Washington DC that the DoD are ready and waiting should a real aerial threat rear its ugly head again. Although the NASAMS may have a very limited place in America's vast military inventory, it is clearly a relevant, flexible, affordable and capable system for the incredibly high stakes job of protecting our most sensitive and cherished installations, landmarks and personnel. For more on NASAMS check these two manufacture brochures.